I’m recovering from a really bad cold. To give you an idea of how sick I’ve been, I actually went to the doctor (something I rank just below sitting in a middle seat on a flight without wifi), and I wouldn’t get out of bed for 1,000 free AAdvantage Miles! 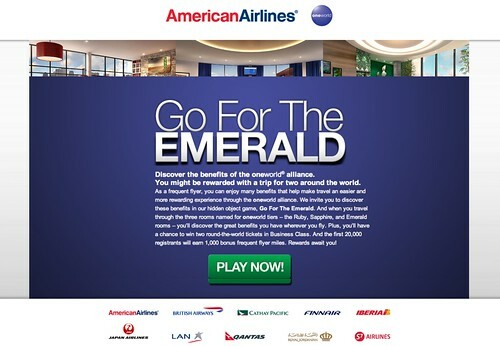 Play our hidden object game, Go For The Emerald, to explore your oneworld elite benefits and register for your chance to win 2 Business class tickets for a trip around the world. Be one of the first 20,000 people to register and earn 1,000 AAdvantage bonus miles! I was still a little groggy, but because of the offer of 1,000 Free AAdvantages Miles, I briefly reconsidered, maybe I had passed on, and Whataburger was just the waiting room to Paradise. But then, the aches and pain kicked in and reminded me that I was still here on earth, and was facing a dilemma. My iPad was out of reach, my laptop in another room, and for a moment I thought about getting out of bed. But after some synaptic back and forth between my brain and and the rest of my body, it was decided that it hurt to much to walk, so brain and body went back to sleep. (Side note: After reading this post from Mrs. Deals when I woke up, I learned too late that I could have entered on my iPhone. Anyway, I won’t miss out again, I just activated my Deals We Like email subscription). Discover the benefits of the oneworld alliance. You might be rewarded with a trip for two around the world. As a frequent flyer, you can enjoy many benefits that help make travel an easier and more rewarding experience through the oneworld alliance. We invite you to discover these benefits in our hidden object game, Go For The Emerald. And when you travel through the three rooms named for oneworld tiers – the Ruby, Sapphire, and Emerald rooms – you’ll discover the great benefits you have wherever you fly. Plus, you’ll have a chance to win two round-the-world tickets in Business Class. Rewards await you! How To Play: Find the hidden items in each room. You’ll find a clue for each item at the bottom of the page and a hint button for some additional help. Get through all three rooms and enter for your chance to win a trip around the world. ENTRY DETAILS: Open to legal residents of the 50 United States and the District of Columbia who are 18 years or older. Sweepstakes begins at 11:59 a.m. Eastern time February 22, 2012 and all entries must be received by 11:59 p.m. ET time on April 27, 2012. PRIZE DETAILS: One Prize consisting of 2 oneworld Explorer 3- continent tickets, ARV $21,480.56. There is a limit of a total of five entries per email address regardless of entry method. Go here to enter and good luck! Ahhh – you’ll get it another time! it was brutal anyway, so probably not worth the time spent! ps thanks for the nuts! @ worldtraveller2 – Glad I didn’t try then.